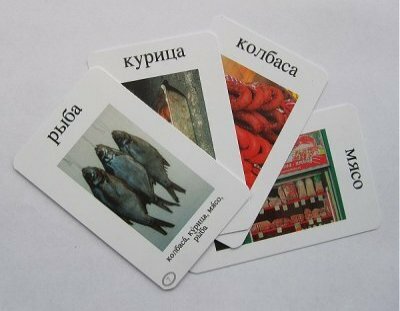 These are two packs of 64 cards (4 x 16 "families") which can be used for several different classroom activities, but mainly for the traditional card game "Happy Families", which practises Ñƒ Ñ‚ÐµÐ±Ñ� / Ð²Ð°Ñ� ÐµÑ�Ñ‚ÑŒ ...?, the use of genitive after a negative and the use of the accusative after Ð”Ð°Ð¹Ñ‚Ðµ, Ð¿Ð¾Ð¶Ð°Ð»ÑƒÐ¹Ñ�Ñ‚Ð°, ..., as well, of course, as all the vocabulary on the cards. Learners work in small groups. First shuffle and deal out the cards. The first player asks of one of the others, for example, if he or she has the car. â€“	Ð£ Ñ‚ÐµÐ±Ñ� / Ð²Ð°Ñ� ÐµÑ�Ñ‚ÑŒ Ð¼Ð°ÑˆÐ¸Ð½Ð°? â€“	Ð£ Ð²Ð°Ñ� ÐµÑ�Ñ‚ÑŒ Ñ�Ð¾Ðº? â€“	Ð�ÐµÑ‚, Ñƒ Ð¼ÐµÐ½Ñ� Ð½ÐµÑ‚ Ñ�Ð¾ÐºÐ°. and the turn is ended. As soon as you have a family of four cards in your hand you put them face down on the table. The winner is the person who collects the most families. There are two sets of cards at different levels. The first includes singular inanimate nouns only, the second includes some animate nouns, some nouns with adjectives and some plurals. 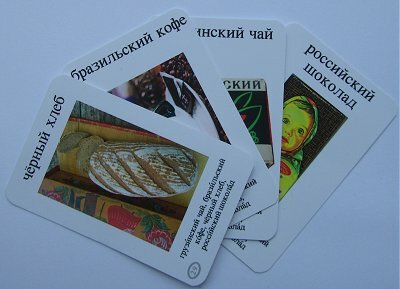 The cards are the same size as large visiting cards and are hard wearing. They are packed in strong plastic boxes with an instruction leaflet. 2. Ð°Ð²Ñ‚Ð¾Ð±ÑƒÑ�, Ñ‚Ð°ÐºÑ�Ð¸, Ñ‚Ñ€Ð°Ð¼Ð²Ð°Ð¹, Ð¿Ð¾ÐµÐ·Ð´. 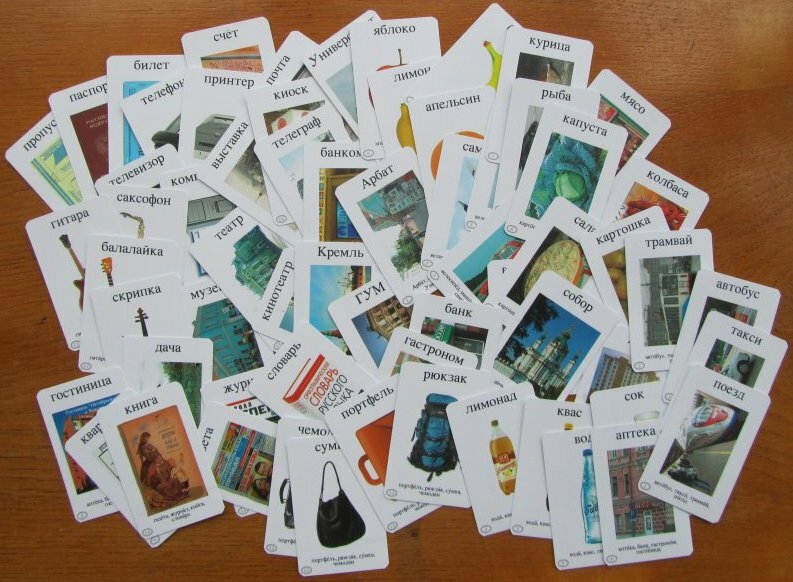 You can ask more advanced learners to choose their own adjectives to go with the nouns. 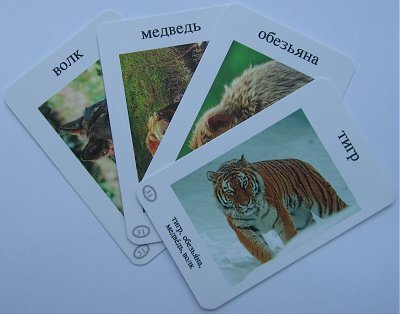 If you are teaching 1:1 then take one card out of each family before you start the game and play with families of three. That way your opponent has to guess which cards you have!